The Hotel boasts 75 Austrian-inspired double or twin rooms for couples and friends to book for mid-week and weekend short breaks. The beautiful Hotel is nestled within the woodland landscape with views over the lake, through the trees. Just 50 minutes from central London, the Hotel is surrounded by thriving forest and is close to the Aqua Sana spa, gym, watersports lake, restaurants and shops. Just a five-minute walk away is the Subtropical Swimming Paradise and a wide variety of indoor and outdoor activities such as archery, tree trekking, canoeing and badminton. The rooms, like the 625 Lodges at Woburn Forest, are designed to help guests feel connected to the forest surroundings. Center Parcs is a car-free environment, making it the ideal place to get close to nature. A majority of guests choose cycling as their way of getting around, bikes are available to hire from the Village Cycle Centre. 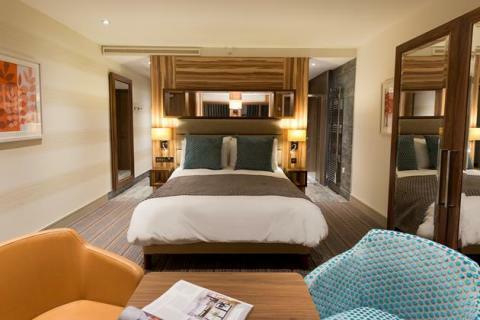 Center Parcs’ uniquely designed rooms also feature a mirror behind the exposed headboard with mirror behind which has been added to give depth and space to the room and to draw the forest surroundings into the bedroom. The bed is situated in the centre of the room, with the toilet and washing facilities tucked away behind it for added privacy. Amongst the 75 Hotel rooms, there are a selection of rooms with self-catering facilities, offering guests the chance to prepare refreshments and meals in the comfort of their own space. 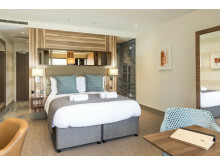 Woburn Construction Director, Don Camilleri, said: “I first saw this room design in the Tyrol Valley while on holiday and it was perfect for the new Center Parcs Village. The rooms felt spacious but cosy and celebrated the beautiful setting. Like Center Parcs, it’s the connection with the outside that guests want and every aspect of the room design embodies that. They are simple, stylish and comfortable, offering luxury accommodation for pairs, close to nature”. There are a variety of good public transport options for those wishing to get to Center Parcs Woburn Forest. The closest station is Flitwick, which can be reached from London St Pancras in under one hour. From there, shuttle buses can take guests from the station to the Village in just under seven minutes. In addition to this, First Capital Connect provide a discount for guests on train tickets to Flitwick. Woburn Forest is on track to open this spring. Guests can currently book a short break for arrivals between the 20th June 2014 and the 27th April 2015.